It was difficult to make room in the Town Library for the books which were inherited on the death of George Stacey Gibson in 1865, so Mrs Elizabeth Gibson paid for the Gibson Room (recently refurbished) to be built to house them. A lot of the books in the Town Library reflect the Gibson's interests; George Stacey Gibson was the author of the Flora of Essex, which explains why he collected so many books on botany and zoology. These can be seen in the bookcases. As brewers they had books on brewing and temperance and as bankers they collected books on finance. George Stacey Gibson's Quaker faith influenced almost everything he did. 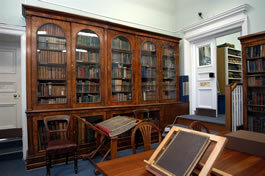 These are the original bookcases owned by George Stacey Gibson and given to the library with his personal collection of books.